Pakistan Cricket Board (PCB) chairman Shahryar Khan has announced at a press conference that six bilateral series will be played between subcontinental rivals India and Pakistan over the coming eight years, starting from a tour of Pakistan’s ‘new home’, the UAE, by the Indian team in 2015. Pakistan are scheduled to travel to India for a subsequent series in 2016. An MoU has been signed between PCB and Board of Control for Cricket in India (BCCI) to decide that 12 Tests, 30 ODIs and 11 Twenty20s will be played between the two natons over this period, the PCB chairman also said. “Cricket has an important role in building relationships. And sports and politics should be kept separate”, said Khan. He also said that during his visit to India, he could not get around to meet the BCCI head Jagmohan Dalmiya due to the latter’s illness but that he had positive discussions with him over telephone. “Resumption of cricket between the two countries was discussed,” he told media persons. Despite never having been beaten by Pakistan in a World Cup, India have an ODI record of 51-72 and a Test record of 10-12 against its neighbours – records that the reigning world champions will be looking to improve on. Pakistan have been barred from hosting international matches after a terror attack on the visiting Sri Lanka team bus in 2008-09, which led to the series being abandoned and the traumatised Lanka team flying back home. India visited Pakistan on a tour last in 2005, a series best remembered for Virender Sehwag’s 328-ball 254 in Lahore’s Gaddafi Stadium. When asked if India will visit Pakistan for a series in the near future, the PCB chairman said, “I hope so”. “Because things are getting better. Peshawar and Quetta are not good but the rest of Pakistan is pretty good. We have now got two or three venues – Karachi and Lahore – where we can seal the area around the stadium. The danger is in the travel between the hotel and the stadium, this is what happened to the Sri Lankan team (in 2009). Pakistan captain Misbah ul-Haq has rued the fact that Pakistan are the only Test-playing nation who have been starved of international cricket on home turf for more than half-a-decade now. “It is a big dilemma and it is time the cricketing world comes together to push for international cricket in Pakistan,” Misbah had said in 2012. PCB chief Shahryar Khan said, “This year we will see one or two other teams visiting Pakistan. The bigger teams have told us that you get these associate teams in Pakistan and demonstrate that the security situation is much better, we will also consider. “Netherlands was supposed to come and they will come a little later. Ireland and Scotland are keen. Nepal I hope would be coming next month. So these associate members are ready to come to Pakistan. 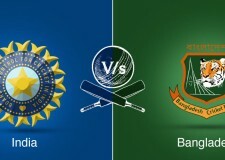 The India-Pakistan Pool A match was recorded to be the most viewed event on Indian television since the 2011 World Cup final, and one can expect that cricket viewing in the subcontinent is set for a sharp rise in the next 8 years.